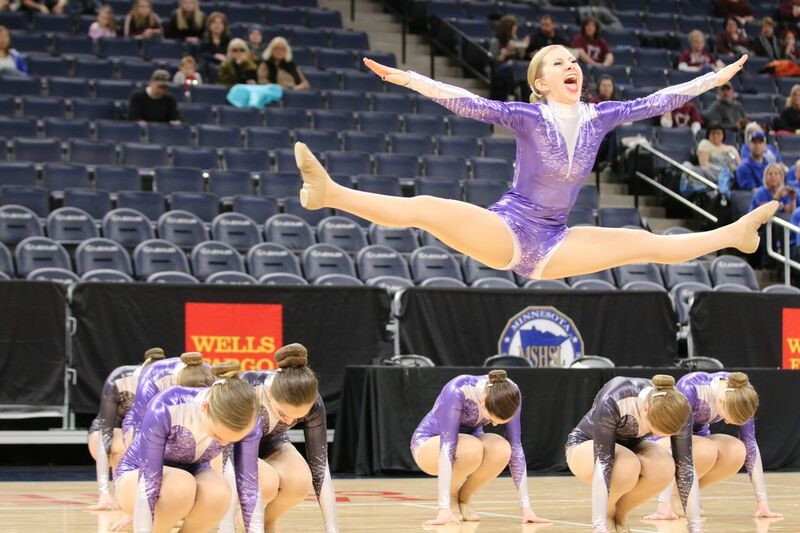 The dance team recently finished their season at the state tournament. Junior Brooke Beissel doing her solo at state. Once again the Cannon Falls Bomber Dance Team has had an outstanding season winning their 11th consecutive HVL conference title, taking home the blue at the section 2A high kick competition and making yet another appearance in the final round of the high kick state tournament. However, like any other team the varsity dancers faced some hardships during their season from the first day of practice to the their last performance on the state floor. At the start of the season the team was faced with the challenge of finding a new assistant coach. Adapting to new coaches’ style isn’t always easy but former Lake City varsity head coach, Heather McWaters, was good fit for the team giving them to a strong start to their season by leading Class A in average points. Their next setback came during the third competition of the season where the zippers of on their costumes began to pop 20 minutes before their performance. Although feeling defeated the super women in the crowd (moms and grandmas of the dancers) came to the rescue and were able to pin the costumes up allowing the team to perform at their highest level. Their last setback came at the most important day of the season: State. The State tournament consists of two rounds, the preliminary round and the final round at which the top 6 in the preliminary round competes. During the first round sophomore Macy Duden unfortunately fell injuring her ankle. Sophomore Alison Larson commented on this saying, “ Not only was I worried about not making it to finals but about how Macy was.” The team had to stop mid performance and dance again within the next five minutes. Despite this, the team was able to pull it off landing 4th in prelims and 5th in finals. Many members of the team also had many personal accomplishments along with achieving all the team’s goals. Seniors Kendra Lecy and Brooke Kimmes both made the Wells Fargo All-Tournament Team along with the Senior Academic Award in which they had to have a cumulative GPA of 3.85 or higher. Senior Mia Holscher and juniors Brooke Beissel and Jenna Skaggs all made the MADT All-State in which they will perform March 10 at Eden Prairie High School with dancers from across the state. The team lost six seniors this season, four of them being the team’s only captains. When asked about the new leadership of the team head coach Jamie Swenning stated “All of them are veterans and have witnessed the leadership of the team from past so I believe that they are all qualified and will do a great job”. All members of the remaining team are optimistic about their future and plan on continuing their past success in the years to come even with the of lack of members present on the team.